This morning the captain of Volvo Ocean Race entry movistar, after a night spent fighting severe leaking from the failure of one of the pivot points of the Spanish entry’s canting keel, chose to abandon ship. movistar was about 300 miles from the race’s finish line in Portsmouth, England, at the time. Lots of interesting detail is available from the official VOR site: movistar abandons ship. The boat’s ten crewmembers transferred via liferaft to ABN Amro Two, which had turned back to assist movistar and had been standing by throughout the night. 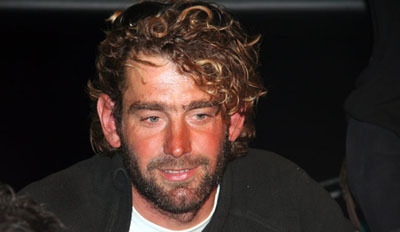 The transfer was made during relatively light winds as the eye of a northern storm passed over them, but one of the main factors in movistar skipper Bouwe Bekking’s decision to abandon the vessel was the forecast for winds gusting to 50 knots. “Ten lives at stake, with a similar number of families, the right call,” Bekking said in an interview from ABN Amro Two. movistar is currently adrift, with a radio beacon transmitting the boat’s position. In other VOR news, most of the boats have reached Portsmouth, ending the last long-distance leg of the race. Unsurprisingly, this leg was won by the overall race leader, ABN Amro One. Two shorter races remain. 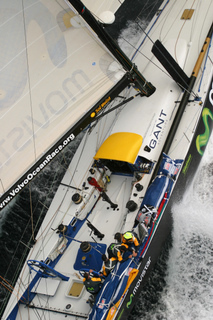 Photo: A shot of movistar taken before the beginning of the VOR, by Sally Collison / www.sallycollison.com. In all my talk about the risks faced by crews in the Volvo Ocean Race, I always focused on the dangers of the Southern Ocean. But as we all know, any stretch of ocean can be deadly. Early Thursday morning, as the VOR fleet crossed the North Atlantic in the last long-distance leg of the race, Hans Horrevoets, a 32-year-old crewmember on ABN Amro Two, was swept overboard by a wave and drowned. 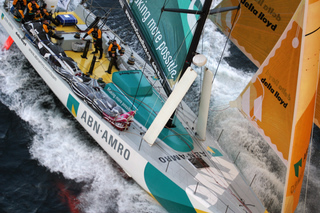 ABN AMRO TWO was sailing downwind in 25 – 30 knots of wind under main, fractional spinnaker and staysail. Seb Josse, Skipper of ABN AMRO TWO was at the helm, Hans, 32 of the Netherlands was trimming the spinnaker sheet, Nick Bice, Andrew Lewis and Lucas Brun were also on deck. The boat nosedived down a wave and water came washing back down the deck, when the water cleared Hans was no longer on deck. Photos: Hans Horrevoets, from the official Team ABN Amro site. And ABN Amro Two, courtesy of Sally Collison / http://www.sallycollison.com. In the Volvo Ocean Race, the four boats that have not yet suffered any serious breakdowns are still very close together, with ABN AMRO One having an 11-mile lead on Brasil, then Ericsson 1 mile back, and ABN AMRO Two 2 miles back from there. See the official VOR site’s position maps page for details. Five hundred miles astern, Sunergy is back on the course and racing, though at a significantly slower speed than the boats in the lead pack. And back in Portugal, some really interesting news has come out regarding the breakdowns to movistar and Pirates of the Caribbean, neither of which will be rejoining this leg. An article from the Telegraph has extensive discussion with Paul Cayard about just what went wrong on Pirates — and it doesn’t sound pretty: Cayard fears for Volvo 70 safety. Instead of having a keel with a hinge on the outside beneath the hull, like the Open 60s competing in the Transat Jacques Vabre, the Volvo 70s have their pins inside the hull. This leaves a door-sized hole in the hull bottom. The box – dubbed by Cayard the “fish bowl” because it has an inspection window – sits over the hole in the hull and the hydraulic rams pass into it, sealed by industrial-strength gaiters. Pirates’ problem was that the fairings are meant to seal the hull bottom. When one fell off, it was not just a question of lost speed through increased drag but of the entire integrity of hull depending on the “fish bowl”, which was not designed to withstand the tons of pressure that were building up inside it. Over at movistar, the damage to the hull and appendages that was revealed when they hoisted the boat out of the water has led the team to conclude that they must have hit something big — like a container. More details from the official VOR site: Bad, but not quite as bad. Again, more detail is available in this item from Yachting World: movistar damage caused by collision. Photo: movistar in happier days. Photo by Sally Collison, http://www.sallycollison.com. In an audio interview at 1230GMT, Ericsson navigator Steve Hayles told the Volvo Ocean Race web site that the boat was stopped in the water and crew members Jason Carrington and Richard Mason were in the water cutting away ropes from the keel and rudder. Thirty hours ago, during the first night, Ericsson had what Hayles described as an issue with a sail and a halyard, and had been sailing since with the debris hanging off the appendages. It was only now that the conditions were judged safe enough to put the swimmers in the water to resolve the problem. Mike Sanderson, skipper of ABN AMRO ONE spoke to Race Headquarters at 1200 GMT and shocked radio reporter Guy Swindells with a very matter of fact report of a fire on board. Apparently a bolt had dropped into the battery box and lodged between a battery terminal and the carbon fibre structure. Carbon fibre is conductive and the resulting short circuit took out the wiring and systems in navigaton, communications and the media station. Once the fire was controlled, navigator Stan Honey, an acknowledged electronics expert in the field of TV and films, and not just an offshore navigator, has managed to re-wire the damaged areas so that they are now able to communicate and use their electronic navigation systems. Meanwhile, Sunergy, the Australian team whose finances, and partcipation, were in doubt up until the last days before the start, has suffered a failure of the mainboom gooseneck, and is reportedly heading into port for repairs. More on the carnage in this Times Online article: Volvo boats crippled by raging seas. At the front of the fleet, it’s currently a seesaw battle between Brasil 1 and ABN AMRO One, with Ericsson and ABN AMRO Two slightly farther back. Photo caption: Water flows over the side deck into the cockpit of Brasil 1. ©Brasil 1. There was an interesting account in the latest issue of The Log about the grounding of Blue Law, a Hunter 54 that got stuck on a sandbar near the entrance to Newport Harbor on November 5: Sailboat runs aground in Newport Harbor entrance. Southern California tends not to have the extensive shoals that East Coast and Gulf sailors learn to deal with; groundings around here are relatively uncommon. But we do have little patches of sand here and there that claim the occasional victim, and acquire a bit of local notoriety. I’ve run aground in San Diego Bay off the southern tip of Shelter Island, in the Oceanside Harbor entrance, and in King Harbor in that little corner between the yacht club and the breakwater. I never ran aground (so far) in Newport Harbor, but I haven’t spent much time there, aside from coming in the night before the Ensenada Race a few times. A nasty storm a couple of days ago in the Bay of Biscay, followed by ongoing mayhem from strong tradewinds, have knocked out 5 of the 10 60-foot trimarans competing in the doublehanded transatlantic race currently under way between Le Havre, France, and Bahia, Brazil. Here’s a writeup from Latitude 38 with aerial photos of the capsized Orange Project and Foncia: Snap, crackle and pop at Transat Jacques Vabre. As if starting the biennial doublehanded transatlantic race in 25+ knot, on-the-nose winds and rough seas weren’t enough for the 19 monohulls (Saturday start) and 16 multis (Sunday start), Sunday night a cold front rolled in, blasting primarily the multihull fleet with 35 to 45-knot winds and reported 20-ft seas. In the wee hours of Monday, EPIRBs went off on the 60-ft trimarans Sodebo and Orange Project. The former snapped off its port ama and capsized. The latter suffered a broken main beam and also went upside down. Three hours later, at 0615, a report came in that Foncia had also capsized. With the retirement of Brossard earlier on Sunday with a cracked main hull, that takes four of the ten 60-ft multis out of the running. The six co-skippers of the three capsized boats were rescued, some more banged and bruised than others but all okay. At this writing, their smashed boats were all either under tow back to land, or about to be. The prevailing conditions at the time were classic Trade wind 25 – 30 knots from the North East. The trimaran was sailing downwind and it is presumed that therefore the hull pitchpoled on capsize but this is not confirmed. What we do know is that Franck Proffit was at the helm and was thrown violently forward, and has possibly broken his ribs. A helicopter has been sent from the Canaries to the zone to pick up Franck Proffit from the boat in order to give him immediate medical assistance. Franck Cammas is staying on board in order to commence a salvage operation for the boat with his shore team. Groupama-2 had been pushing hard all day after their 5 hour pit-stop in Santo Porto at Madeira between 0400 – 0900 hrs local time this morning to repair their steering and rudder systems, and had been clocking average boat speeds over 25+ knots. That brings to 5 (of 10) abandonments in the 60-foot trimarans of the ORMA class. Also retiring have been two of the Open 50 trimarans, and one of the Open 50 monohulls. So far the boats of the remaining class (Open 60 monohulls) have not suffered any retirements. More info on the ongoing racing is available from the Transat Jacques Vabre official site. You can also check out cool realtime position maps of the survivors at the French-language site http://voile.esrifrance.fr/. I was interested by this article from last week’s Times of London about the potential for mayhem in the upcoming Volvo Ocean Race: Global race starts under a cloud of safety fears. The new Volvo Open 70s could hardly be more of a contrast to Volvo’s safetyconscious designs for the family car market. The boats are only 10ft longer than the old Volvo 60s, which were used in the last race four years ago, but they are much more powerful and much more dangerous. Capable of exhilarating performance, with a top speed of up to 40 knots, the super-light Volvo 70s demand total concentration from their ten-man crews, with manoeuvres in rough seas having to be precisely choreographed if spectacular wipe-outs are to be avoided. The new boats are more complex than the 60s and include hydraulically controlled keels that swing through an arc of 40 degrees either side of the centre line, giving the yachts extra lateral stability, plus daggerboards either side of the mast to prevent the boats slipping sideways. Conceptually, it makes all kinds of sense. In flat water, under ideal conditions, I’m sure it makes for intense sailing excitement. But in the Southern Ocean, I just don’t know. Paul Cayard, the Californian skipper of The Black Pearl, a boat sponsored by Disney in a unique marketing campaign to promote a sequel to the feature film Pirates of the Caribbean, is concerned about the swing keels, which have had a mixed reliability record in other classes. “The technology is a little more on the edge,” he said. I continue to think that the relatively conservative (emphasis on the “relatively”) boats of the ABN Amro campaign may end up doing significantly better than their poor showing in the opening race last Saturday would seem to indicate. I was also interested by the quotes coming from ABN Amro One skipper Mike Sanderson, as quoted in this post-race writeup from the official site: Worry no more. Time will tell on that one, obviously. Photo: That’s In Port race one winner Ericsson taking the pin end at the start, on her way to stretching out to a big lead on the left side of the first beat. Photo by Rick Tomlinson.